Fake congressman gets backstage at Obama Congressional Black Caucus event. 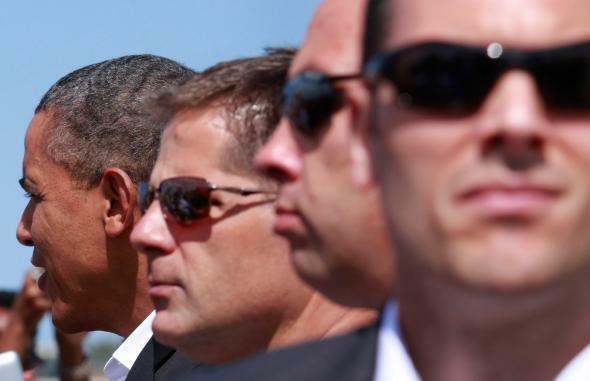 Secret Service agents stand watch as President Obama greets supporters. Following recent revelations about several serious breaches of presidential security, Bloomberg News rounds out the week with yet another incident involving questionable protection of the president. A White House official tells Bloomberg a man posing as a member of Congress was able to gain access to a secure backstage area for President Obama’s appearance at a Congressional Black Caucus Foundation awards dinner last weekend. The man entered the backstage area during or just after Obama’s speech at the Walter E. Washington Convention Center as members of Congress gathered there to have their pictures taken with the president, said the official, who asked for anonymity to discuss the incident, which has not previously been made public. The unidentified man said he was Representative Donald Payne Jr., a Democrat from New Jersey, the official said. One member of the White House staff determined that the man wasn’t Payne, and another asked him to leave, the official said. He did so without incident and wasn’t detained. The Secret Service, already facing criticism for allowing an armed intruder inside the White House and an armed felon to ride in an elevator with the president, told Bloomberg the agency did its job screening attendees at the dinner. It remains unclear how close the bogus congressman got to the president or first lady.